This is our Christian President…really? It’s a beautiful church with no name. 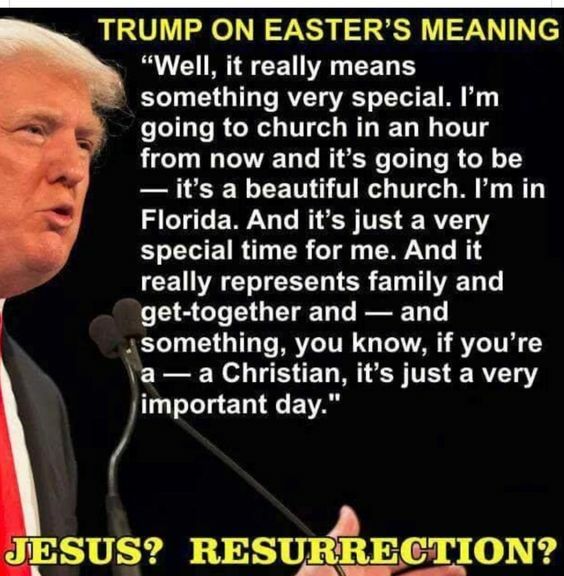 But, actually Easter is a time for families, get-together and golfing…the perfect Christian description of the holiest and most sacred day of the liturgical year. Now I understand why the white Evangelicals adore this man. He is the perfect embodiment of their values. He knows almost as much about discipleship as he does about governing. This entry was posted in News & Views, Quotes and tagged adoration, Christian, church, disciplship, Easter, evangelical, families, get-together, golfing, governing, holy, Jesus, liturgical year, resurrection, sacred, Trump, values on May 4, 2018 by Ray Buchanan.